Glen Transport removals and storage Stirling, are specialists who pride themselves on delivering a professional, friendly and hassel free removals service. The company have experience since 1975 in local, national and international.Glen Transport endevour your goods arrive safe and secure wherever you are moving to.Glen Transport trade under the BAR recommended conditions of contract. Glen Transport are members of the BAR British Association of Removers membership number G032. Choosing a BAR Member will ensure your move goes smoothly, having the peace of mind that comes from using a reputable, professional and safe remover, and in the unlikely event that something goes wrong, you've got someone to turn to. BAR recommended conditions of contract. At times it may not be possible to move direct to your new home. Glen Transport are easily accessible for storage in Stirling, we are the specialists who can can provide purpose-built storage containers which would be packed at your address. This method is secure, ensures safe, clean and dry storage in the companies purpose built warehouse. Glen Transport are a specialists removals company based in Stirling, in the heart of Scotland and an a ideal location to serve the entire country. The company are one of the longest established independent removals companies, trading since 1975. Bar removals specialists who pride themselves on delivering a professional, friendly and hassel free service. Local, national and international moves for commercial and domestic customers. Fully insured and accredited to ensure your goods arrive safe and secure wherever you are moving to. As members of the British Association of Removers, Glen Transport are committed to upholding their renowned standards. BAR regularly inspect to ensure that our systems and facilities meet the stringent standards adn comply with the BAR code of practice. The company use BAR training facilities for all employees. Choosing a BAR Member will ensure your move goes smoothly, having the peace of mind that comes from using a reputable, professional and safe removal company, and in the unlikely event that something goes wrong, you've got someone to turn to. If you're looking to move - whether in the UK or interanationally for domestic or commercial relocation then search for a BAR Member, and Look for the BAR badge'. 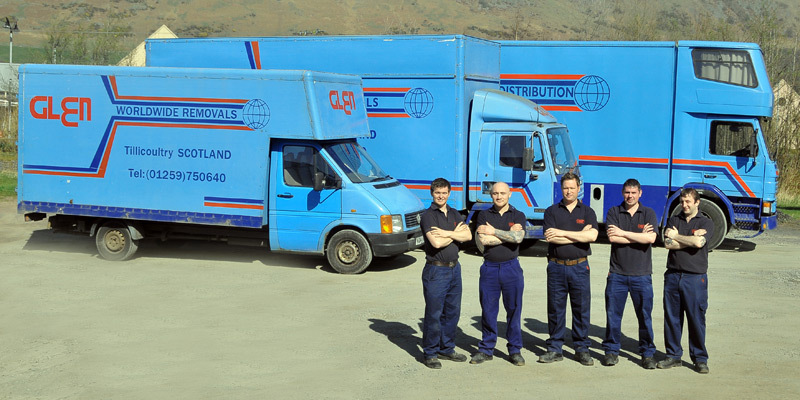 Glen Transport is a family owned removals and self storage company based in Stirling.Glen Transport offers a worldwide service to relocate containers to the most accessible destinations.They also offer full packing and relocation service to all customers both private and corporate. All self storage in Stirling is fully containerised for security and Safety. If not then why don't you send us a quick message? Self storage in Stirling is the perfect option if you are moving house, downsizing or if you do not have the access to a large vehicle.Your belongings will be packed and loaded straight into specially designed dry, secure containers at our Stirling Storage facility, and will then be sealed and stored in our secure warehouse until you need them returned exactly as you last saw them. Making us the ideal storage solution for Storage in Stirling and surrounding areas. Sometimes it is just not possible to move from one house straight into the next in one simple step.Our self storage warehouse is only a stone's throw away from Sterling Centre and will hold your belongings until you are ready for the big move. Access can also be arranged by appointment if required. "We really appreciate all the hard work and care that went into our successful move from Menstrie to Dunblane. Dave and his team were amazing. They took great care with our belongings and work that they put in despite the heat was incredible. Many Thanks." "We wanted to say thank you to both you and your team for all you have done for us over the last however many moves! What was a difficult experience has been made much more manageable by your kindness, not to mention your efficiency. So, once again, thank you very much"
"Just to say that your help during our delayed move was much appreciated, and all those involved with the loading and unloading have been friendly and effective, and a pleasure to deal with.Many thanks." As members of the British Association of Removers Glen Transport are committed to upholding their renowned standards. BAR regularly inspect to ensure that our systems and facilities meet the stringent standards & comply with the BAR code of practice. They use the bar training facilities for all employees.